You all know the song "Ladybug Samba". It is a big hit song of Cherish that was released in 1973 (Showa 48), and it is a million seller song of the Showa era everyone knows if it is a baby boomer generation. This song circled around the Japanese archipelago on a television and radio on a daily basis. The composer who worked on this big hit song is Mr. Shunichi Makaino. Mr. Shunichi Makaino was born in Toyohashi-city, Aichi prefecture in 1946, went to Tokyo in 1965 and debuted in the songs field with "arrange for you all" in 1967. In the year of Osaka Expo in 1970, he was arranging for "Laugh and forgive (Wada Akiko)" at the age of 24, and received the 12th Japan Record Award and Arrangement Award (youngest record). As composers, mainly composers, including compositions, "Ishikari Elegy (Kitahara Mirei)" "Scorpio woman (Kenichi Mikawa)" "North Sakaba (Takashi Hosokawa)" "Cape Erimo (Shinichi Mori)" Mr. Shinichi Mori " Flower (Agnes Chan) "and more have worked on more than 12,000 works. When finishing writing a song, since a new pencil will be completely gone, if you pile it up vertically, it is surprising to say that it will be about seven times the size of Tokyo Tower. I am constantly working with the positive attitude aimed at "what I have never had". For example, when I was asked to arrange the representative song "Hokkaido" of Takashi Hosokawa, I wanted to aim for an enka singing to young people with light rhythm, instead of making it a dark enka so far, I ran a pen on the staff. As a result, a bright and light song was born. This song was instantly supported by people and became a big hit song. Mr. Shunichi Makaino went to eat my favorite soba (soba) with two music companions with different genres, careers, and age with a lot of excitement ten years ago from now. While eating soba, flowers bloomed in various stories, seniors 'experiences encouraged juniors, juniors' story gives seniors energies, I learned that each other has good influence. I thought that it would be a waste to keep such opportunities to only three people, I called a friend and asked a familiar acquaintance, and decided to continue this gathering called "soba party". Every time we repeat, we gradually increase the number of people participating and when we gathered about 20 people we officially renamed the name "Buckwheat noodles or southern mountain horse" and in 11 years until 5 December 2018 Performed 34 times. The basic stance of "talking beyond genres, careers, generations and having fun while eating favorite soba is still unchanged from now on. Mr. Shunichi Makaino will celebrate 73 years this year, but there is vitality that is the same as at 24 years old. In mind of "what has never been before", recently I worked on the arrangement of Yukino Ichikawa's new song "Snow Love Flowerl" released on January 30, 2019. The Fu Nu performance is played, and it is finished in a song that makes you feel a sense of hit dramatically and deeply. 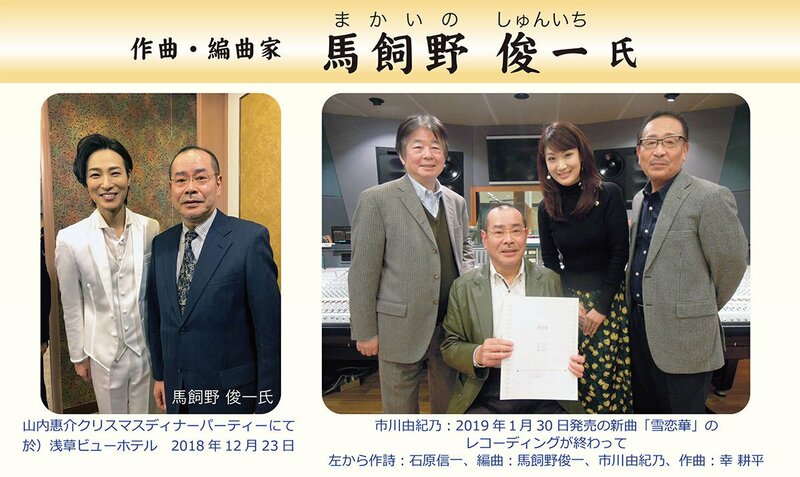 He also arranged arrangement of Keisuke Yamanouchi's "Farewinter Winter Storm" regularly participating in NHK red and white singing fight and received the 33rd "Masato Fujita Award" (award ceremony at the shipping club on January 25, 2019)). On March 6, 2019, Keisuke Yamauchi's new song "Lip Scarlet" will be on sale, but I also arranged the arrangement of this song. As long as there is still life, as long as music life exceeds 50 years, as a challenger, I have breathed a hot breath to the Japanese music industry.